Becky, Uncorked. : Loads of coffee and loads of craic. Loads of coffee and loads of craic. Well, all right, I guess I'll tell you. I had a fairly successful first (full) week of classes, most of which went fairly smoothly. I did have a rather, ah, unsuccessful experience class-wise on Thursday, so here goes. Here's some background information: I am a scheduling genius, and therefore I only have one (afternoon) class on Mondays and Thursdays and no class on Fridays. Thus, last Thursday I had only one job: to attend my European Cinema class at 4 pm in Kane G02. Sounds easy enough, right? That's what I thought, too, until about 4:07. But I'm getting ahead of myself. It all began when I arrived about ten minutes early to class, putting myself in the awkward position of loitering outside the room waiting for the lecturer and a few students from the previous class to leave. Naturally, I pretended to be busy with my phone until the situation resolved itself, and then I entered the room with the few other students who had gathered outside the door. I strategically chose a seat in the middle of a row so that I wouldn't be the jerk who forces latecomers to crawl over everyone else to get to a seat (so thoughtful, I know--it's my tragic flaw). People kept coming in and my row started to fill up when someone who appeared to be the lecturer entered the room. Interestingly enough, this lecturer was not the lecturer I was expecting. Even more interestingly, he started pulling up PowerPoints about 'Business Modelling and Systems Analysis,' which is definitely not European cinema. After my initial thought of, 'Wow, this lecturer is totally in the wrong room...that's embarrassing for him,' I looked around and realized that no one else was surprised and that they all had notes with the same title. I assessed the situation more clearly and began to panic, since I was now completely hemmed into my row and the lecturer was starting to speak. Awkwardness prevailed, and I concluded that there was simply no way out, so I kept out my blank notebook and hoped that the lecturer would not directly address me. To sum up, I sat through fifty minutes of gibberish, quietly hoping that no one had picked up on the (rather obvious) clues that I was not in that class, like the fact that I didn't take any notes or that I didn't swipe my student ID on the attendance machine or the look of utter bewilderment on my face. I left the lecture completely confused but also hugely relieved that the ordeal was over, and I eventually returned to my flat to find that the class, in fact, meets at 5 pm instead of 4. Now I know. Okay, now it's time for bigger and better things. This weekend, IFSA-Butler took us all to Killary Adventure Centre (it's pronounced sin-tray) near Galway for some great craic. Sidebar: 'craic' is pronounced 'crack' (actually), but it means 'fun.' So if someone asks you where the craic is, you don't need to run away. Just tell them where they can go to have a good time. Anyway, this adventure weekend is one of two trips sponsored by IFSA-Butler where everyone studying in Ireland converges for one huge weekend full of craic. We stayed at a hostel in the middle of nowhere, and it was quite possibly the most naturally beautiful place I have ever been. There were sheep wandering all over the grounds and the road, providing the cutest roadblock ever. The hostel overlooks Ireland's only fjord, so the view was not too shabby either. Not jealous yet? Keep reading. We arrived at Killary around dinnertime on Friday after a 5- or 6-hour bus ride (I was asleep for a lot of it again) and ate a hearty meal before exploring the grounds. The UCC kids (that includes me) found a kitten outside the hostel and followed it around obsessively with little coffee-sized packs of milk. The next morning, most of us went to a high ropes course that included ziplining, which turned out to be a wonderful choice. We harnessed up and started with our first activity: climbing up a tall, shaky pole to crowd four people at a time onto a tiny square board (probably about one square foot). Once everyone was up on the 'platform,' the goal was to lean back and form a sort of star shape over the rest of the group. It was completely terrifying, but also probably one of the coolest things I've ever done. swaying and also way higher than it looks. Next, we moved on to the zipline, my second favorite activity (we haven't talked about my favorite yet). It was so good that I snuck in a second turn...shhh. The road from the hostel to adventure-land. but I found zero pots of gold. 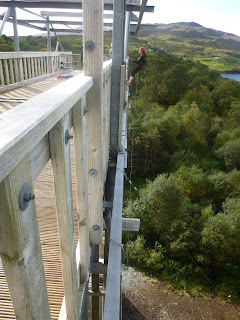 For the afternoon, we signed up for rock climbing, abseiling (basically rappelling), and a giant swing which had been described as 'similar to a plane crash.' I was surprisingly almost good at rock climbing, but unfortunately there are no pictures to prove it. 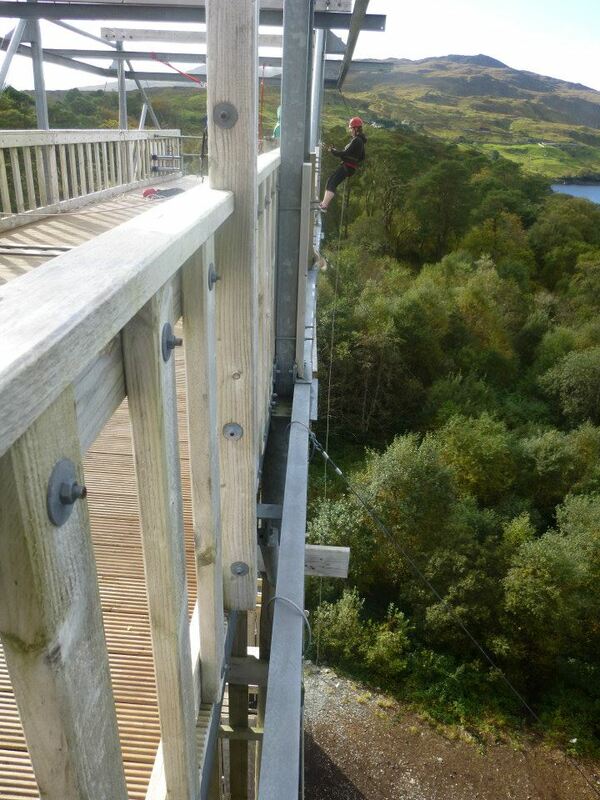 Abseiling was less fun and more terrifying, but the view from the top of the tower was worth it. I rode the giant swing with Evie, who is not a big fan of heights but told me to make her go anyway. Even before we did it, I knew the giant swing would be my favorite activity because I love heights, especially when I'm securely in a harness. Once we were properly strapped in, our dreamy instructor Ross showed me the small rope I would be pulling on to cause us to fall initially. It was a lot of pressure, but I felt like I was up to the task. A motor connected to some rope (detailed explanation, I know) pulled us up really high and then it was my time to shine. I tried pulling the crash-rope, but it wouldn't work and people started yelling and Evie started to turn on me. After a lot of tension, it eventually worked and we did, indeed, fall really quickly and feel like we were on a crashing plane. Evie screamed like an alien, and I screamed not as scarily but still a lot. Good craic. Not there yet. Evie was probably turning hostile. One of the many sheep friends we made. The next morning, we signed up for shooting and archery, which was interesting because I have no aim whatsoever. However, I'd also never shot a gun before, so I went. Our instructor had a really thick Scottish accent, so I understood about half of the things he said to us, which probably didn't help. Once my turn came, he kept trying to tell me that the gun would not kill me, which is obviously untrue. I don't think he knew what he was talking about. He also kept telling me that I wasn't aiming at the clay pigeon at all, but already knew that. I also knew that aiming was futile, so I was just shooting, you know, into the air. I thought it was fine, but he thought it was funny. Archery was less weird- and forbidden-feeling than shooting a gun, but that didn't improve my aim whatsoever. In any case, I did it and I felt like Legolas the whole time. All in all, the adventure weekend was a great success. I had loads of coffee, but I also had loads of craic. It's a great combination. In which I get my Irish life together...maybe.